At Soundgas we source, service and supply the very best in classic, vintage and exotic electronic instruments and recording equipment. Music runs through our veins - we’re passionate about sound and are committed to delivering exceptional service to our customers worldwide. Approaching thirty years of experience buying, restoring and maintaining vintage gear – initially for my studio, and latterly for Soundgas – has informed the ethos that is at the heart of what we do. We are musicians and gear enthusiasts first and foremost, and understand how to deliver exceptional service to our customers. From the excitement and inspiration that comes from choosing the right piece for your sound and workflow, to the gear becoming part of your studio/set-up, we’re here to support you on your creative journey. I used to find buying vintage gear was like a lottery: sometimes you got lucky and the item arrived as described, but often this wasn’t the case.  Too many delicate synths got damaged due to poor packing or careless couriers. I sent a flightcase for a seller to ship my mint Juno 60, but he left the mains plug loose inside, which dented the pristine front panel and cracked the arpeggiator board. Finding the right tech to service or repair old gear was always tricky, but today it’s become near-impossible. We’ve lost a good many engineers over the years and nowadays few seem to possess the right combination of experience, technical know-how, and the essential time/business management skills required to run a reliable repair service. When it’s time to move your gear on, you want to ensure it goes to the right home and that this happens with minimum disruption, and that you receive a fair price in return. I have always loved old equipment – it is the beating heart of Soundgas – sharing the joy and inspiration in discovering and using vintage gear that works. WE WORK WITH SOME OF THE BEST AND MOST EXPERIENCED TECHNICIANS IN THE WORLD. Our in-house engineers have wide-ranging expertise - Huw and James head the tech department, they have more than 20 years experience each working on a huge range of instruments and other equipment. In addition we use a handful of very carefully selected freelance techs who specialise in certain pieces of equipment, and who's work and attitude matches our own. We stand behind every piece of gear that we have worked on with a guarantee of your satisfaction.